Last spring, just as I was healing from my last wrist surgery I was asked if I would like to make a display stand for (the delicious) Bixby Bars, made by Bixby & Co of Rockland Maine. I said yes immediately, but I will admit that my motivation and eagerness to take this job on was also a little personal. I am a native Californian of many generations on both my mother's and father's side. On my mother's side I am a direct descendent of the Bixby family who had settled in California around the time of the Gold Rush. I had always been a little curious if Bixby & Co. was related in some manner to my family. When I went to talk with Kate McAleer about the project I found that indeed, her family descends from the Bixby family from St Louis. So small world, we became Bixbys helping Bixbys. Through our talking about the company and being based in Rockland Maine, plus the coming on of summer I started to get the image of a the ocean and the beachiness of Maine. Kate's mother (who works with Kate) kept saying "show her the book plate". 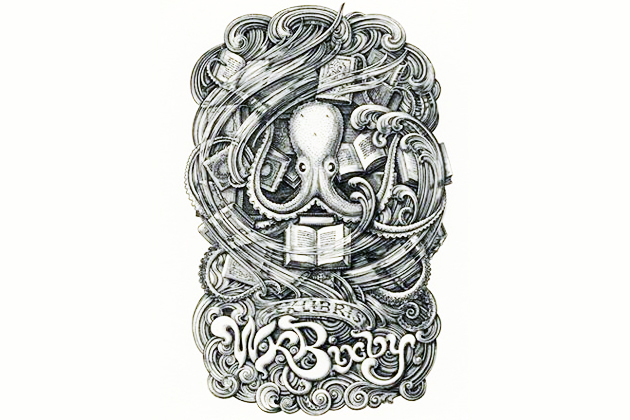 As it turns out the book plate was from WK Bixby of St. Louis and was drawn by Edwin Davis French. The waves and the octopus were a perfect match for the kind of lively design they were looking for. Kate had recently updated the packaging of the Bixby Bars from rich gem tones to vibrant eye catching colors. I used the packaging to color match the colors I used in painting the stand. Everything from the octopus to the lettering is hand done. In my early 20's when I was just getting into the art world I paired to be a painter. Its been about 25 years since I have used paints and brushes—but it was REALLY fun! I guess I had kind of missed that. Recently I made three more stands for Bixby & Co. Look for these stands in the Hanafords all over the state of Maine. And look for a new table top display to be made sometime later this year.